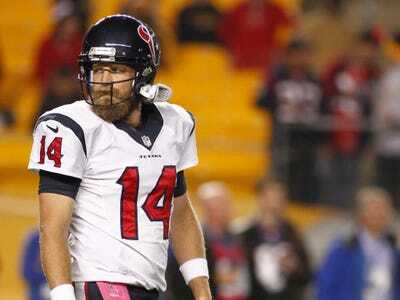 Getty ImagesIn 3 years Ryan Fitzpatrick has made $US25 million and lost 3 jobs. The Houston Texans have announced that Ryan Mallett will replace Ryan Fitzpatrick as their starting quarterback. This is now the third job Fitzpatrick has lost in the three years since signing a huge $US59 million contract to be the franchise quarterback for the Buffalo Bills. In October 2011, the Bills were 4-2 and appeared to be on their way to their first playoff appearance in 12 years thanks in large part to the play of their quarterback. Fitzpatrick had played well the previous season and was off to a good start in 2011 with 12 touchdown passes in the first six games. During their bye week that season, the Bills and Fitzpatrick finalised a 6-year, $US59 million contract extension that included a $US10 million signing bonus. Fitzpatrick and the Bills won just two of their final ten games that season, and then in the first year of his new contract, the Bills went 6-10. After the season, the Bills cut Fitzpatrick, meaning he was paid just $US17.8 million of the $US59 million contract. Prior to the 2013 season, Fitzpatrick signed a 2-year, $US6.5 million contract with the Tennessee Titans but was cut after just one season (9 starts). He made $US3.3 million that season. Prior to this season, Fitzpatrick signed a 2-year, $US7.3 million contract with the Texans as a free agent. However, that was before the Texans traded for Mallett from the New England Patriots and now it looks like Fitzpatrick will be cut after the season having made just $US4.0 million of his latest contract. Amazingly, Fitzpatrick still counts against the salary cap for all three teams according to Spotrac.com. In all, Fitzpatrick has made $US25.1 million in the last three seasons. Not bad for a guy that has lost his job three times. But it is still a far cry from the $US59 million he would have made if he stayed with the Bills.